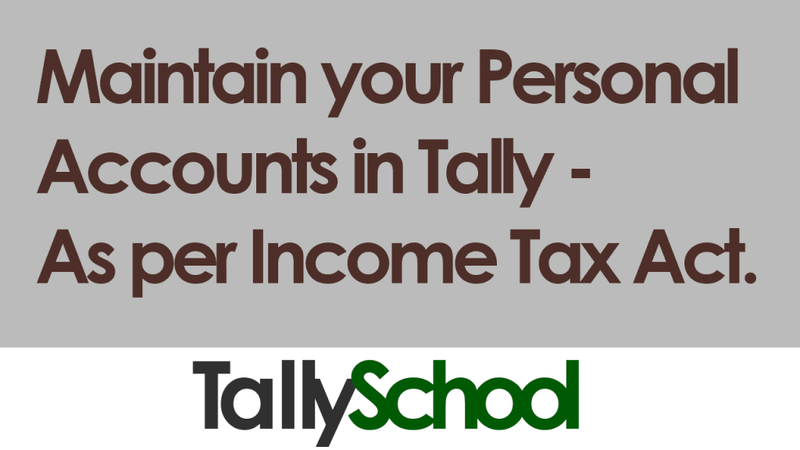 You can easily maintain personal accounts in Tally as per the Income Tax Act, 1961. You just need to know the right method which I am going to explain you in this post. To maintain personal accounts in Tally is very easy and simple. It is much more fast than maintaining accounts for a company in Tally. The reason is that personal accounts are comparatively very small and involve only a few amount of entries. Now compare that to a full fledged company which is selling products and includes all kinds of accounting entries and on the top of that, there is GST accounting entries too. But when you maintain personal accounts in Tally, there is generally no GST involved and you need to just focus on your balance sheet. So, let’s get started step by step. I’ll explain everything you need to know on how to maintain personal accounts in Tally as per the Income Tax Act, 1961 – Indian Income Tax Law. When you have to maintain personal accounts in Tally, you should mainly focus on balance sheet. There is a specific reason for that. In personal accounts, there are no business accounts involved because it is your personal accounts. Therefore, there is NO need for a Profit and Loss Account. If you have a business, I recommend you maintain accounts of your business separately and not mix the business accounts with your personal accounts. By this you will have a clear understanding of where your business stands and where your personal assets stand. Here is what the Balance Sheet looks like of a person who has created his or her personal accounts in Tally for the first time. You can see the balance sheet only if you have created a company in Tally. Click here to know how to create a company in Tally. Also, I have created a capital account by my name and altered the opening balance of cash account. Here is how you can do it. Now, select Create under Single Ledger. Now, create a ledger by your name and it will be under Capital Account. 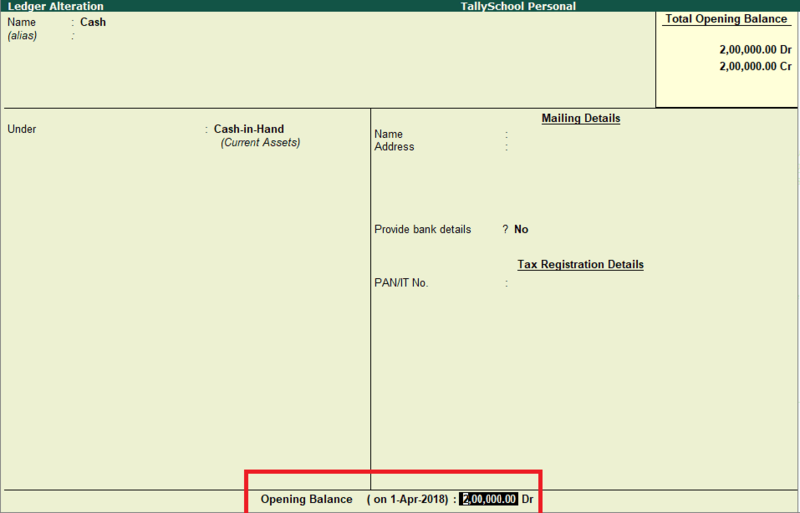 Now, we will alter the opening balance of Cash Account since Cash Account is by default created in Tally. So to alter it, you need to come one step back to ledgers menu in the above process. Instead of Create under Single Ledger, select Alter. Select Cash from the List of Ledgers. Go down to the Opening Balance section and put the amount to ₹2,00,000. Now, go the Balance Sheet from the Gateway of Tally and see how it looks. Look the capital account on the left hand side of the Balance Sheet which is in my name. On the right hand side which is called the Asset side, there is cash. If you know basic accounting in Tally, this is what a simple Balance Sheet looks like. Makes sense, right! Let me explain you what it means. You brought in cash in the form of capital and hence cash and capital are both increased by ₹2,00,000. This is the most basic form of balance sheet and you will not see a single balance sheet like this in real life. It is just an example through which I have explained the meaning of the Balance Sheet to you. Now, in real life a person has certain assets and liabilities as well. For example, generally a person has some assets like a vehicle and a house, some investments like LIC, mutual funds and stock market and some amount in bank account also (especially after demonetization). The above was just the assets side. There will be certain liabilities as well. It can be a housing loan, any kind of payment remaining unpaid like – house rent, amount payable to stock broker and so on. So, let’s do the entries in Tally for the above things that I have mentioned and then we will move forward. Let’s say you purchased a vehicle for ₹30,000 from the above cash of ₹2,00,000. I have created a ledger for Vehicle under Fixed Assets in Tally. You can go through this post if you want to know in detail how to create a ledger in Tally. If you have a car or a two wheeler the accounting entry will be same. Now, let us purchase some land for ₹50,000. The entry will be similar to that of the above entry. I’ll leave that for you. It is a mini test for you. Still if you face any difficulties, please comment down below the post and I’ll help you. We still have ₹1,20,000 left after buying a vehicle and a land for ₹30,000 and ₹50,000 respectively. Let’s buy some investments. For example, let’s say, I want to buy mutual funds of ₹30,000 and gold for ₹50,000. The ledger of Mutual Funds will be under Investments. Similarly, the ledger of Gold will also be under Investments. The entry for buying Gold is also exactly the same as Mutual Funds. Again, I’ll leave it for you as a mini test, so you can check your knowledge whether you have learnt it or not. When you buy something, it is a payment entry in Tally and therefore you have to select Payment Voucher in Tally for that. After buying Gold of ₹50,000, we are left with Cash of ₹40,000. Let’s deposit ₹20,000 in the bank account. I’ll create a ledger called Bank under the group Bank Accounts. The entry for depositing cash into a bank account is called a contra entry and therefore we have to use Contra Voucher in Tally for passing this kind of entry. Whenever you deposit cash into a bank or withdraw cash from a bank including ATM, you have to use Contra Voucher in Tally. You can have a look at the 4 basic accounting vouchers in Tally, which I have explained in detail. If you pay close attention to the top left corner of the picture, it says Contra in the pink badge. So, now we are left with ₹20,000 cash. Now let us look at the balance sheet once again. Just look at the Asset side of the Balance Sheet. Now, here is a quick accounting question for you. All the assets including Cash – where it came from? It primarily came from the capital as of now which is on the Liabilities side in the form of Capital Account in my name. It will be in your name in your Tally if you are preparing the Balance Sheet with me right now which is a great practice, if you want to do it. Now, let’s move forward and see the Liabilities side of the Balance Sheet in Tally and with that we will also start with a new topic which is Capital Account in Tally. Let’s assume you are doing a job and you receive a salary of ₹20,000 a month in your bank account after all the deductions except TDS about which we will discuss later in this post. This is just one month salary and you have pass this same entry with the date when you receive the salary for each month. So, every year you will have to create 12 entries for salaries. As you are receiving the salary, it will be a receipt entry in Tally. You can look at the pink badge and it says Receipt. You can choose different accounting vouchers from the right hand green bar along with its shortcuts in Tally. After you will create 12 entries of salary in Tally for the entire year, the balance sheet will look like in the picture below. Salary is showing under Capital Account because the ledger for salary will be under Capital Account when you are writing your own personal accounts. The reason for that is, Salary increases your capital and thus it comes under the capital account in Tally. One more thing you should notice is that if you have done correct accounting, the assets side and liabilities side will always be equal. In our case, the salary increased by ₹2,40,000 and on the liabilities side, the bank account increased with the same amount. Have a look at it. Now, let’s say, you withdraw ₹10,000 every month for your living expenses. This amount is reasonable. For that you have to create withdrawal entries for every month because as you get the salary every month, you will be withdrawing money accordingly. The entry for withdrawal will be bank payment entry because you are paying to yourself from the salary that you got into your account. Let us look at the same entry in Tally. Please remember, you have to pass this entry 12 times every month as you did with the salary. It makes sense because every month you might go to an ATM for taking out your monthly expenses or just withdraw it from the bank. Now, go back to the Balance Sheet once again and see your capital account. You will see the negative figure of ₹1,20,000. The withdrawals figure is negative because when you use the money for your expenses, your capital gets reduced and hence the negative balance in the capital account. Also, this is a standard practice as per the Income Tax Act ,1961 because logically, you need to spend some money to live well. There is nowhere written in law that you should do this, but this a standard practice. If you are living with a joint family, the withdrawals can even be ₹5,000 per month per person if there are 4 people in the house. Now, let us look at the TDS on your salary. When you get your salary, TDS is deducted from your salary. TDS is nothing but advance payment of income tax. Let’s for simplicity assume that the TDS on your salary for this example is ₹5,000 and you are applying for the refund of the TDS because your income – salary is under the base limit for income tax which is currently ₹2,50,000. For creating a TDS entry you need to understand the nature of TDS. Firstly, when the TDS is deducted from your salary it is an expense for you otherwise you would have got ₹5,000 of more salary which means, it is actually your own salary. That means tax is deducted on your salary in advance. That’s it. So if the TDS of ₹5,000 is deducted from your salary, your actual salary will be ₹2,40,000 + ₹5,000 = 2,45,000. In this case, you do not need to pay taxes so you will have to pass another entry for the refund of TDS. If you are taking the refund of TDS, that means it is kind of advance given to the government. Therefore the TDS Refund A/c will be under Loans & Advances (Assets) on the Assets side of the Balance Sheet. Both of the above entries will be Journal entries in Tally because there is no cash or bank account involved in any of the above entries. Here is what the Balance Sheet looks like after passing both of the TDS entries in Tally. Look at the Loans & Advances (Asset), which I have selected in Tally. It is of ₹5,000 and that is nothing but the TDS Refund. Now, we have covered almost everything that is needed to maintain personal accounts in Tally. Till now, we have covered a lot of personal entries in Tally and I showed you to enter the income in Tally in the form of salary. You have learnt the salary entry in Tally. And, remember this is all as per the Income Tax Act, 1961. I have not calculated the tax here but other than that this all is as per the Income Tax Law. Now, one last accounting treatment is required which is to close the current accounts. At the end of every year, no matter whether you maintain personal accounts in Tally or business accounts but you have to close the current accounts. The entries to close the current accounts are called closing entries. Closing the current account simply means consolidating current accounts into capital accounts which are carried forward to the next year. In our example, there are only 2 current accounts that need to be closed and consolidated into a capital account. They are Salary and Withdrawals. They both will be closed i.e. consolidated into the Capital Account and then the Capital Account will be carried forward to the next year. This is how normal basic accounting works. Let’s close both the accounts against the capital account. Similarly, the journal entry for closing Withdrawals account would be the exact opposite. After you pass both of the above entries in Tally, you will know that now, both these accounts disappear from the Balance Sheet. That is because their balances are now zero and therefore they are closed for this year. We have consolidated them into our Capital Account. You can see that the amount of ₹3,25,000 is same in both the Capital Account as a total and in Rishit Shah’s Account which is again a part of Capital Account. This means we have successfully closed the current accounts and now these personal accounts are called finalized accounts. When people say, that the accounts are finalized, they generally mean that all the entries are done and current accounts are closed. Now, from here you can easily export the balance sheet and capital account to file your income tax returns. From now on you can easily maintain personal accounts in Tally of yours as well as your family and friends. For a non-commerce person, I want you to know that what I have explained in this post is nothing more than basic accounting and a little bit of Income Tax law including standard practices. It is very easy to learn accounting and maintain personal accounts in Tally. Maintaining business accounts in Tally is somewhat complex and requires advanced level of knowledge in accounting. You should create your own personal accounts in Tally right now and test your knowledge about what you have learnt in this post. This way you will easily learn at least to maintain personal accounts in Tally of yours and your family. If you have any doubts, difficulties or suggestions, please comment down below and I will be happy to help you out. I will be uploading that today on TallySchool’s YouTube channel. both ledger under capital account,than what it effect when you passed this entry. as I think TDS on Salary A/c goes under Loans & advances,Because it is advance payment to Govn. and after the refund entry the loans advance account will be nill. if no then please give more clarification on it. Under Loans & Advances, it will be TDS Refund Account as in some cases of salaried individuals, they might not get the TDS refund that’s where the above entry is used. But, if you are sure of getting the TDS refund, you can directly pass the entry as you said. Yes, I will upload it soon. I received only first lesson. Pls send the next lessons as you told me earlier. Also, if you are using Gmail, please check your promotions and social tabs. The emailing system is automated, so you must have received the emails. Still, if you have not received them, let me know and I will send them again. Great article. thank you. i wounder for the following year, can we proceed on the tally folder, so that in the end, you what your personal assets are and the finance route. This way, i assume you are always ready for IT scrutiny. I am sorry but I didn’t understand what are trying to say? Can you clarify a little for me? It is Gross Profit c/o means Charged Off which means it is carried down. Gross Profit b/f means brought forward. Hi Rishit ji, How r u. You have created a very nice site for us especially like me who is a novice for tally and did not know even the A B C of tally. You are not only intelligent but also a very good teacher. I appreciate you. Even I told you that I have no words for your appreciation . Thanks for gives us a diamond. Thank you so much for your appreciation. I am really glad that you are able to learn Tally from here. Can you do me a favour? Tell your friends about TallySchool if any of them wants to learn Tally. Thank you Sunil for your kind words. Please let me know if you have any questions about Tally, Accounting or GST. Kindly let me know how to enter cash expense in Tally, and also amount withdrawn from Bank towards cash expense to Proprietor bank account. I made comment in the past is still not answered/approved. Please help. Sorry for the late reply but I have answered and approved your comment. It’s not yet visible in Public. If you can check. It is public and you must have received the email for it. Still, I can answer one more time if you want. It will be nice if you share it again!! I am sorry but the comment seems to get deleted for some reason and I forgot the question. Can you please tell me what was it? I know you might feel angry but I am really sorry. i got some money from my dad. how do i pass this entry in tally, please explain with ledgers. Firstly, you have know whether the money you got from your father is a loan taken by you or pocket money. If it is pocket money, then I will assume you are not going to return it back. The entry in this case will be the introduction of the capital. Personal loan has been taken for personal use from Bajaj Allaince. What will be the ledger group and voucher entry for above. 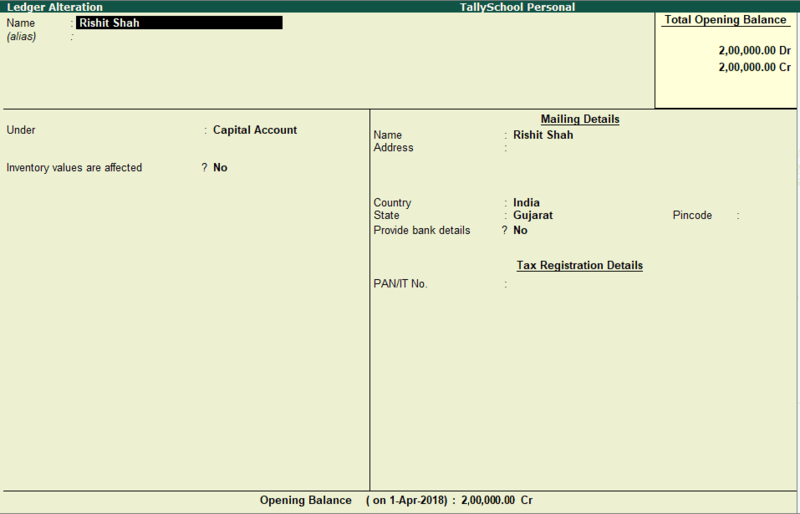 For personal loan taken for personal use from Bajaj Alliance, here is the accounting entry in tally for it. I have a question. If we transfer money to our parents from bank for their daily expenses. & It is not returnable. So what entry should I do? At the end of the year, close the parents account and you are done. Thanks Risghit, actually i am looking this method and you solved it. One more question i want to asked. If i have expensed like telephone recharge, Dish, Electricity even Credit card expenses which is part of indirect expenses of expenses under capital account.? and if i Donate to some one for example Bharat Ke Veer Corpus Fund then which underhead i have to maintain…? Depreciation also i have charged on Vehicle in Fix Assets..? and i have taken a loan from Gruh Finance for Owned Property (Flat) but principle amount i very less deducted from actual taken loan amount so should i maintain interest paid for the year on Self Occupied property if yes then how..? All the above expenses that you mentioned will be under capital account if it is in your personal accounts. If they would have been made for a company or a firm, they would come under direct and indirect expenses.